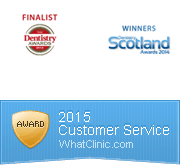 Seven Reasons to Pick This Dundee Dentist? First and foremost we offer a range of both NHS and private dental services. We are proud of our NHS commitments to the community and will always provide this first and foremost. But the NHS doesn’t offer all treatments such as dental implants and teeth straightening without metal braces, that’s why we also offer a comprehensive range of private treatments. This alone is one of the reasons why you should make Vita Dental Spa your Dundee dentist. We understand that most people live very busy lives, so we now offer Saturday and late evening opening, we’re also open most bank holidays. These are often the only times when some of our patients can visit us because of other commitments, so why don’t you call us and arrange an evening or Saturday appointment. Another almost unique reason for choosing Vita Dental Spa as your Dundee Dentist is that we have no waiting list. If you call us for a new NHS or private appointment we’ll endeavour to see you as quickly as possible. Here at Vita Dental Spa we take our social responsibilities very seriously. You may have seen in the news recently that child tooth decay is now at epidemic levels. Sugar has now become the new tobacco and there are calls to increase taxes on sweets and fizzy drinks. So to do our bit to help with the oral health of our local children we are offering Free teeth cleaning training for children – part of the child smile incentive. 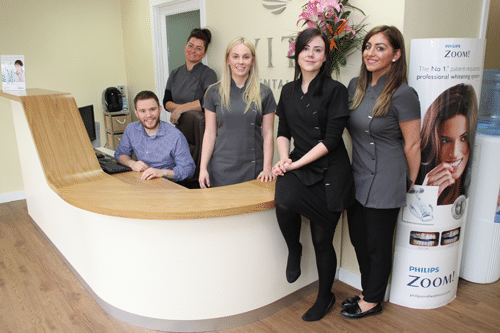 When you visit Vita Dental Spa we like to make you feel as relaxed as possible, so we offer everyone complimentary tea and coffee on arrival. This is just another way we try and make ourselves that little bit different to any other Dundee dentist. As with any other service unfortunately there has to be some payment involved, but here again we try and make this part of your visit as easy as possible, we now accept most major credit and debit cards as well as most other forms of payment. Finally we hope to be offering interest free payment and membership packages in the near future, making payment for those more expensive treatments that little bit easier. When you surf the web looking for a Dundee dentist, please remember to have a look at Vita Dental Spa’s website and see why people travel from all over the region to see us, because we offer that little bit more. For more information please call us on01382 530060 or email us at info@vitadentalspa.co.uk or visit our website at www.vitadentalspa.co.uk or why don’t you visit our Facebook page too.